If you’re looking to buy a set of skis that can take on different types of snow and terrain – no matter what your skill level is – this article is the right place to start your search. Stick around to find out more about the best all-mountain skis 2019 available on the market right now. 1 What are All-Mountain Skis? For a lot of skiers out there, the term “all-mountain skis” can be confusing, especially if you’re somewhat of a beginner and don’t know the terminology quite well yet. These skis are designed to perform well in any given condition, and their versatility is the primary source of their popularity – they are the go everywhere-do anything type of skis. There is a lot more to the purchase of a pair of skis than you might think – measurements, factors, designs; all that may seem intimidating to you if you’re a first-time buyer. To help you out, we’ve come up with a list of all the features that need to be considered before you make a purchase. It may not occur to you, but skis are designed differently to suit the gender (and everything related to it) of the skier. Men’s – Men’s skis can be considered unisex to a degree, but they are primarily designed for men; these skis are made to suit all the different types of terrain, for men of all shapes, sizes, and skill levels. Women’s – If you’re a lady and consider yourself to be an aggressive skier, you may think you need a pair of men’s skis; the truth is, you should stick to models made for women, as they are designed to fit your stance and anatomical shape better. Kids – Kids skis won’t be the focus of our article, but they’re still worth mentioning; these are made to help children improve, so they are rather forgiving and soft and are suitable for all levels of junior skiers. Picking out skis that fit your ability level the most will improve your stability and control once you get on the mountain. With constant innovations, you can be certain that there is a pair of skis that are appropriate for your exact skill level. Your skiing level is directly related to the following three factors on the list – the terrain you’ll ski on, waist width and flex of your skis. Depending on the terrain, there are different ski designs; since the focus of our article is on all-mountain skis, we will list the different types, but we won’t be giving you much detail on them. If you want to read more on the subject, feel free to visit this site. When you start looking for a pair of skis, somewhere in the specifications a set of three numbers will be mentioned; the ski’s waist width is the middle figure. That measurement correlates directly to your skiing style or conditions you’ll be skiing in. Regarding all-mountain skis, the ideal width falls somewhere in the range from 96 to 110mm. Even though the upper limit is fixed, there might be some variations to the lower one – some consider it to go as low as 85mm. However, with narrower models (between 85 and 95mm) you’ll need the right snow conditions to go off-trail. All-mountain skis are available in a variety of stiffness levels so that they can match your skills and your weight. Why is your weight an important factor? Because the more you weigh, the more pressure you put on your skis – that’s why you need to get a stiffer pair. Camber – This is the traditional ski shape; when placed on the ground, the center of the ski is raised. Rocker – Also known as the reverse camber, this ski shape means the tip and the tail are elevated, while the mid-section of the ski is in contact with the snow. There is an increasing number of All-Mountain skis on the market that are using this particular shape. Camber and Rocker Combined – Most all-mountain skis have a profile that is a combination of rocker and camber. The camber will provide stability, while the rocker will help you to initiate turns quickly. Now it’s time to move on to the actual models. The selected six all-mountain skis on this list are the ones we consider to be the best currently available on the market. 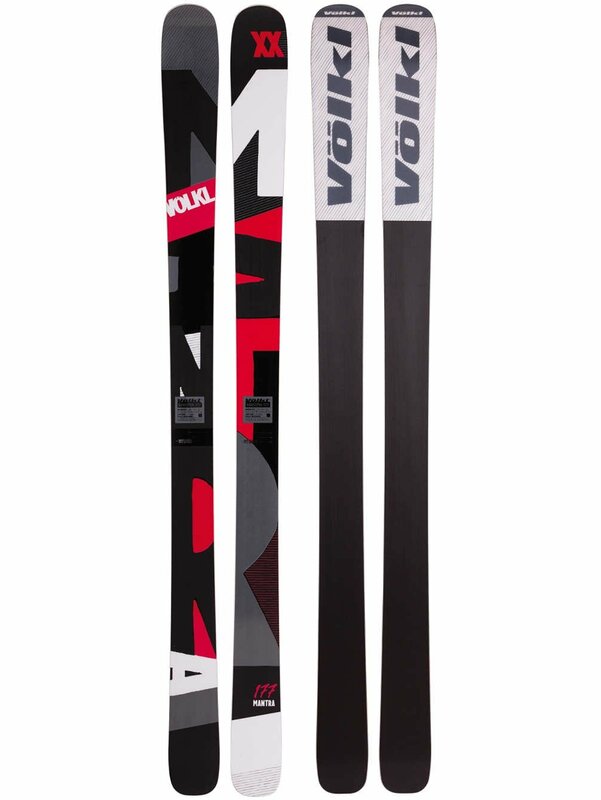 If you and your friends are serious about skiing and often visit ski resorts, names like Volkl and Mantra simply had to come up in conversations; some of you maybe even owned a pair at some point. However, it’s time to talk about the changes that have been made over the last couple of years – the width and profile of these skis have been modified, making these skis one of the favorites in the all-mountain category. The full rocker profile is the main thing to talk about; we’ve mentioned previously that the popularity of this shape is rising in the ski market – an increasing number of manufacturers opt for reverse camber profile for their all-mountain skis. In case you forgot, this means the tip and tail of the skis are not in contact with the ground; we’re dealing with a full, but slight rocker here – there isn’t any drastic elevation, but it’s still enough to change your skiing experience. Also, the fact that it’s fully rockered means it will provide you with exceptional shock absorption. The waist width of the ski is 100mm, which, as you know, falls in the ideal range for all-mountain skis. When combined with its shape, it gives you a virtually unstoppable skiing companion, no matter what type of snow or trail you take them on. The K2 Luv 75’s were designed with ladies in mind – from their ultralight construction all the way to their feminine pattern. When looking for entry-level skis, these are the ones to keep an eye on; their features will deliver the needed forgiveness, while also leaving enough room for you to better your skills and perfect your style. Cap Construction, a method used to build these skis, is focused on lowering the weight of the ski as much as possible, which will, in turn, increase your maneuverability in different conditions. When it comes to shape, these have a combined rocker-camber profile, as most all-mountain skis do. The Catch-Free Rocker, one of the most talked about features of these skis, will provide more control and effortlessly initiate turns at lower speeds – that’s what makes them so forgiving. Also, the early-rise tips will help you conquer any trail, which means forgiveness is not their only advantage – versatility is, too. Another thing that should be addressed is the waist width; at 75mm, this seems to be too narrow for what we consider to be all-mountain skis and, generally speaking, that is the case. However, we’ve mentioned that women’s skis are made differently, to suit their weight and stance – and K2 Luv 75’s are, after all, women’s skis. The manufacturer advertises the Vantage 90 CTI line to be their lightest and strongest all-mountain line ever, and several features contribute to those claims. 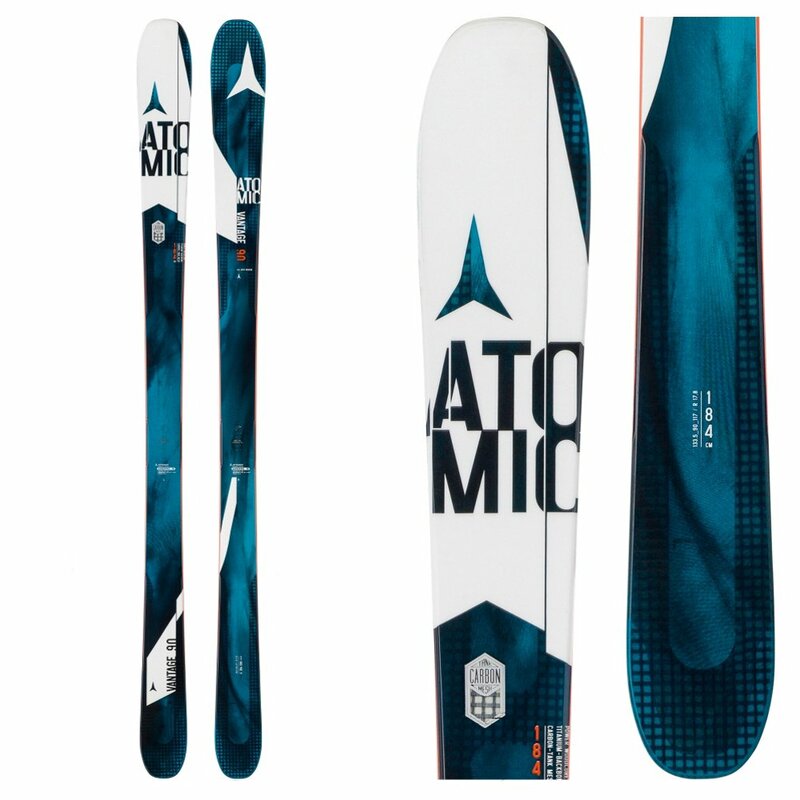 The structural pillars of this Atomic’s model are the Firewall Sidewalls, Carbon Tank Mesh, and Titanium Backbone; when these elements are combined, they provide stability at high speeds and improve the overall strength, while keeping the skis as light as possible. The Carbon Tank Mesh is essentially a sheet of woven carbon fibers, a feature that provides lateral strength, while at the same time minimizing the weight of the ski. Because of how relatively light weight it is, the Vantage 90 CTI gives a somewhat playful feel to the skier, while still maintaining excellent stability. Another feature that is mentioned as one of three structural pillars is the Titanium Backbone 2.0; the skis feature Atomic’s Power Woodcore, a combination of ash and poplar, where one provides strength and the other provides a little forgiveness. The Titanium Backbone comes as an addition to the wooden core and goes from tip to tail, giving more strength and stiffness to the ski, without adding a significant amount of weight. If you’re an advanced skier and are looking for a new set of all-mountain skis, the Vantage 90 CTI might be the right one for you. 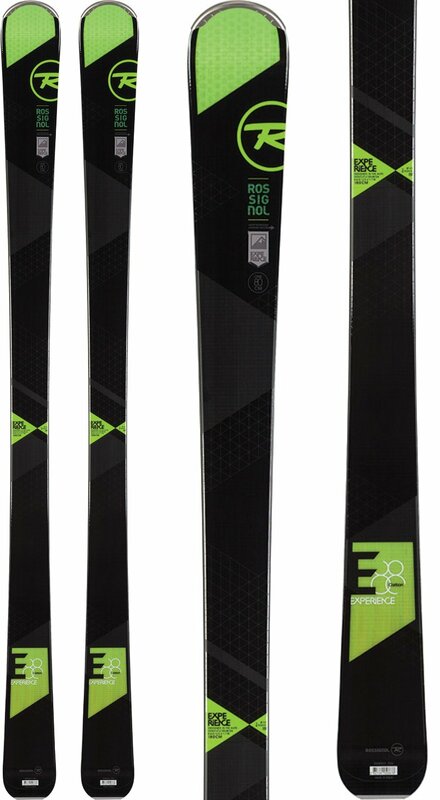 Rossignol’s Experience 88 has always been among the best rated all-mountain skis on the market. Designed with versatility in mind, these won’t let you down no matter what snow type and terrain you encounter in a ski resort. Their performance can best be described as a 50 per cent on-trail and 50 per cent off-trail skis. The waist width of 88mm falls into what’s considered to be the lower range; they are significantly narrower than what we’ve mentioned is the standard width of all-mountains skis. However, this doesn’t mean they are any less versatile; if anything, they are quicker edge-to-edge than some wider models from the same manufacturer. 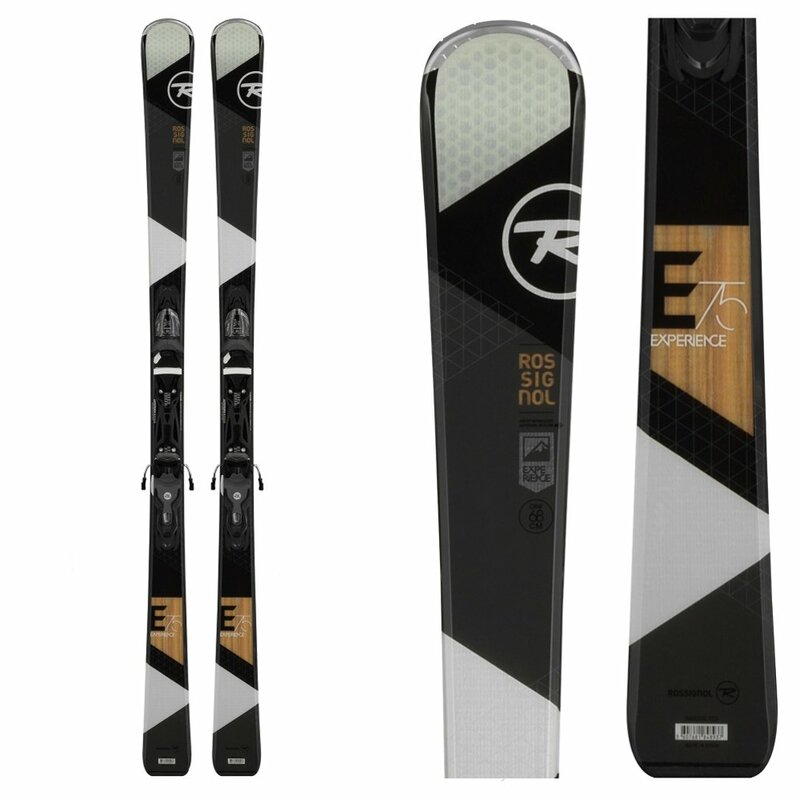 The profile combines the two features commonly found in all-mountain skis – rocker and camber; as a part of Rossignol’s Experience line, the Auto Turn Rocker is a default – the elevation of the tip and tail will provide excellent shock absorption and allow you to float on soft snow. On the other hand, the camber is there for carving hard-pack snow. The Experience 88 is a pair of skies ready to be as slow and lazy or as aggressive as you want them to be. Whatever the case may be, one thing is sure – these will give you an energetic, freeride feeling without going overboard and becoming overpowering. Before deciding on buying them, keep in mind these skis are made for expert skiers. This ski set is another one made entirely for the female population, this time from Rossignol, a name that popped up on our list quite a few times. Even though they are made to be versatile and can handle soft snow, groomers are where these skis are at home. If put in numbers, their performance can be described as 60 per cent on-trail and 40 per cent off-trail; basically, you can be as aggressive as you want on the hard-pack, while still being able to go off the trail comfortably. When it comes to the main design features, there are several worth mentioning. First of all, they are lightweight, which is always a plus in women’s skis; this is due to the wood core and carbon-enhanced construction. The profile combines rocker and camber, meaning they will perform great no matter what the conditions are. A feature that has become a default in Rossignol’s skis is the Air Tip technology – the tip and tail of the ski are filled with air because of their honeycomb structure. If you’re an advanced female skier, keep this model in mind – versatile, relatively budget-friendly and with an excellent overall design, they can be a great companion on the trail and, most importantly, off. These are the ones we recommend for all you adventurous ladies out there. We’ve already had a great pair of entry-level skis for women on our list; now it’s time to review beginner skis for men – the Experience 75 made by Rossignol. There are several qualities beginner’s skis should have, most important one being forgiveness; they need to be easy to learn on and leave enough room for improvement. Also, they shouldn’t require much skill to make them react and move the way you want them to. These Rossignol’s skis offer everything mentioned above. This model is a part of Rossignol’s all-mountain collection, which means a lot of attention was paid to making it as versatile as possible, while still keeping it in the entry-level comfort zone. 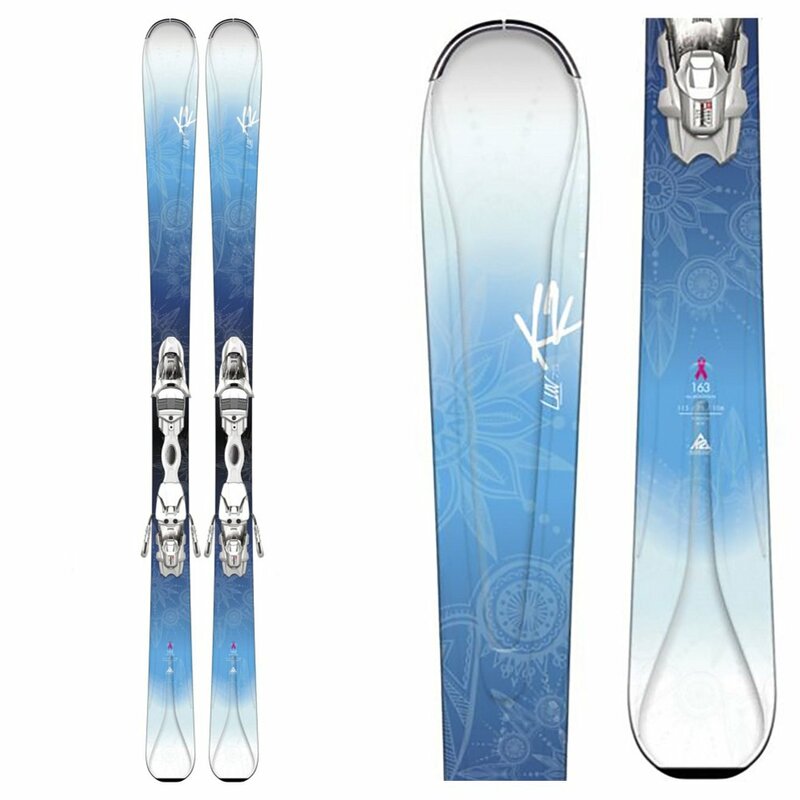 The ski’s profile combines rocker and camber, as many all-mountain models do, so no surprise there. 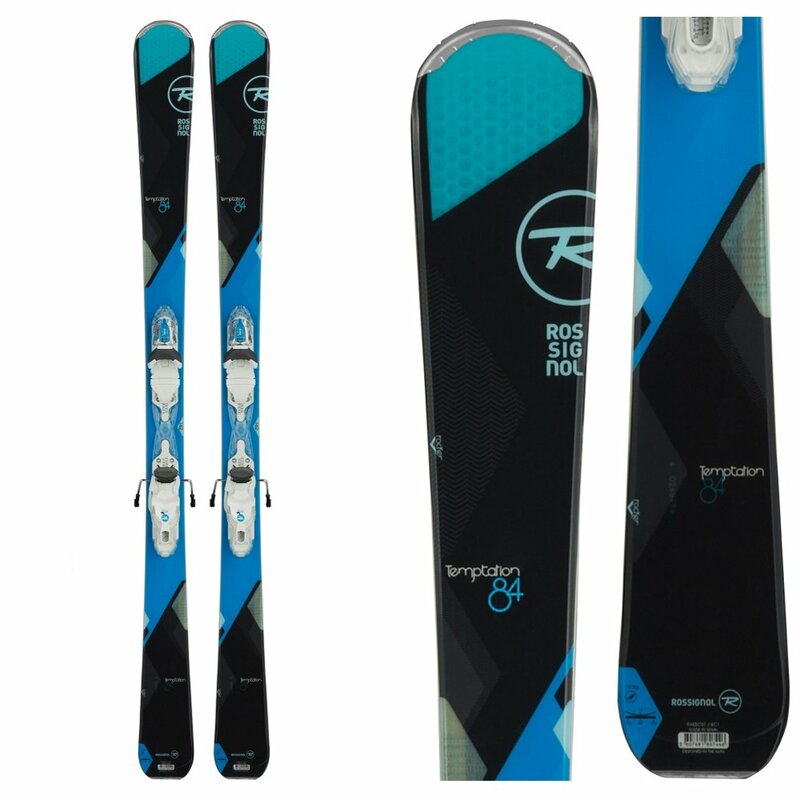 Since it falls in the Rossignol’s Experience category, some features are a given; for instance, the Auto Turn Rocker, which will provide shock absorption and float in soft-snow. All in all, if you are looking to invest in a set of beginner skis, that will work with you and allow you to develop as a skier, you should probably consider these – they have proven to be a great learning tool for many skiers out there. We’ve come to the end of the article, which means it’s time to announce the winner and name one of the models on the list “Best All-Mountain Skis 2019 on the Market.” After careful consideration, we’ve decided that the title should go to the Volkl Mantra Ski. The manufacturer has a long tradition of making great skis, and with the latest innovations, they’ve made their way to the top. Hopefully, you’ve found our article to be helpful; if you enjoyed reading it, feel free to share it with your friends in case they’re looking for a new set of skis.